This is a PrinterTechs custom kit, it includes a PrinterTechs compatible fuser, manual feed pickup roller and separation pad, and cassette pickup roller and feed/separation rollers.. If you order this part from HP or elsewhere you will not get the feed rollers, pickup roller, and separation pad. The Q7502A part number and the RM1-3131 part number are both valid part numbers for the fuser only. There is no official part number for the kit, which includes our fuser plus the rollers. You can save some money by purchasing the kit with a fuser exchange; see exchange terms in the details below. Maintenance kit, with PrinterTechs fuser on exchange. HP Color LaserJet 4700, 4730, CP4005. Maintenance kit, with new HP fuser on exchange. HP Color LaserJet 4700, 4730, CP4005. Maintenance kit, with new HP fuser, no fuser exchange. HP Color LaserJet 4700, 4730, CP4005. This maintenance kit includes a PrinterTechs compatible fuser, plus a full set of rollers and a separation pad for Trays 1 and 2. 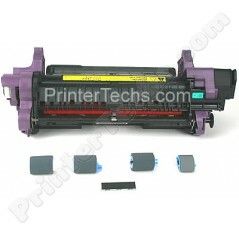 This can be used in any of these series printers: HP Color LaserJet 4700, 4730mfp, CP4005. This is a PrinterTechs custom kit. If you order this from HP or elsewhere you will not get the feed rollers and separation pad pictured below. The Q7502A part number and the RM1-3131 part number are both valid part numbers for the fuser only. There is no official part number for the kit, which includes the fuser plus the rollers.